As your life speeds up this season, don’t let a full calendar mean an empty fridge. 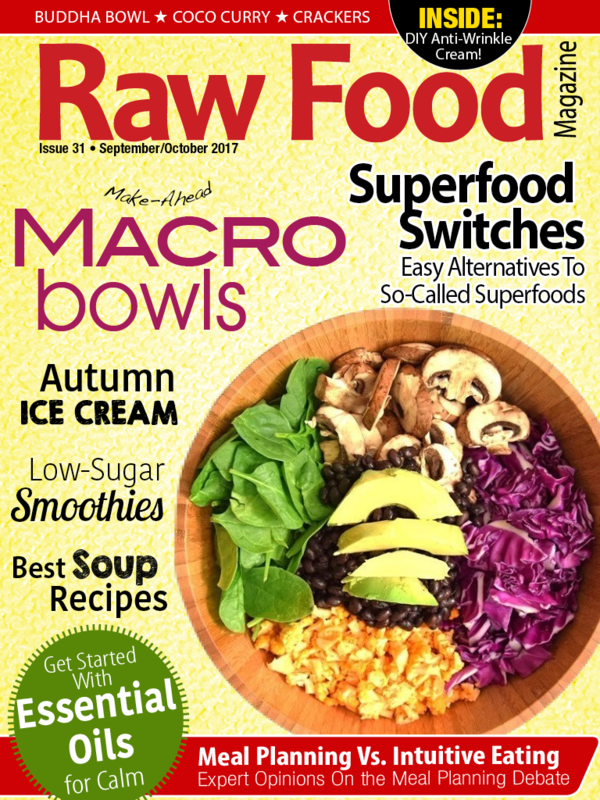 Whether you’re a dedicated meal planner or a free-spirited intuitive eater (we cover both sides of this debate inside), we’ve got your autumn evenings covered with easy make-ahead meals, snacks and fall-inspired ice cream for a healthy late night treat! From simple soups, easy superfood swaps, and beginner-friendly dehydrator recipes (with oven option, too!) it’s time to enjoy the flavors of fall. An exclusive interview with 10+ year cancer fighter and breast cancer champion, Fabianna Marie, packs enough inspiration to last you til Christmas. And, Jason Mraz even shares why he thinks raw food helped land him a grammy. Plus, we added our favorite low-sugar smoothie recipes and our top 5 essential oil secrets for those of you running on fumes who are ready to slow down and go back to basics. Start your Free Trial now and design your own dynamite macro bowl! The 5 Essential Oils You Need To Be Using For a Calm, Anxiety-Free Life!